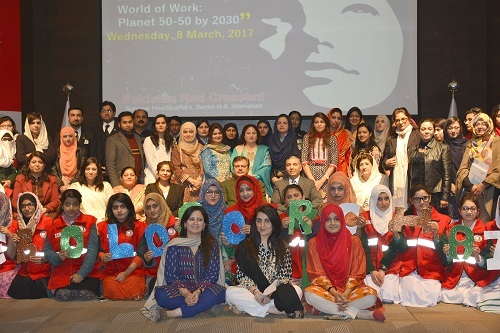 ISLAMABAD: Chairman and Secretary General Pakistan Red Crescent Dr Saeed Elahi and Ghulam Muhammad Awan respectively and Chairperson Pakistan Girls Guide Association Senator Nuzhat Sadiq pose for a photograph with the participants of an event organized in connection with the International Women’s Day at the PRC National Headquarters here on Wednesday. ISLAMABAD March 08, 2017: The Pakistan Red Crescent (PRC) has set up psychological first-aid centers for women all over the country under its Restoring Family Links (RFL) program. This was pledged by the PRC during an event organized in connection with the International Women’s Day under the theme “Women in the Changing World of Work: Planet 50-50 by 2030” held at the PRC National Headquarters here on Wednesday. The participants were briefed about different programs of the PRC including gender & diversity, disaster management, first-aid, blood donation services, youth & volunteers and RFL. The briefing was followed by a panel discussion attended by Chairperson Pakistan Girls Guide Association Senator Nuzhat Sadiq, Humera Hussain, Hadia Aziz and Riffat Haq. The panelists highlighted the role of “Women in the Changing World of Work” and emphasized gender equality, women empowerment and women rights. The panelists said the world of work was changing, with significant implications for women. “On the one hand, we have globalization, technological and digital revolution and opportunities they bring, on the other we are facing the growing informality of labour, unstable livelihoods and incomes, new fiscal and trade policies and environmental impacts — all of which must be addressed in the context of women’s economic empowerment. Addressing the participants, Chairman PRC Dr. Saeed Elahi said the Women Forum Pakistan Red Crescent will address the specific needs of Pakistani women and girls in times of natural and man-made disasters. He said provision of psycho-social referral services was an exceptional step taken by the PRC to address the needs of vulnerable women all over the country. “I would like to extend my warmest congratulations and deepest appreciation on behalf of the Pakistan Red Crescent to all those who have contributed towards promoting the human rights of women in their personal or institutional capacities, and to all those courageous women and men who continue to work for empowerment and well-being of the women of Pakistan”, he added. Secretary General PRC Ghulam Muhammad Awan said the PRC remained committed to empowerment of women and the Women Forum was the right platform where women can make full use of their potentials. “In the past two decades, women have made a remarkable contribution to the country’s economic progress which has actually resulted in narrowing down gender gaps in literacy, legal rights, political participation and service sector employment”, he added. Later, Dr Saeed Elahi distributed shields among the panelists. The event was attended by Chairperson Women Forum Pakistan Red Crescent Saiqa Raziq, Program Officer Regional Blood Centre Dr Wasifa Mohtasim, First-Aid Program Officer Dr. Amna Khan, members of Women Forum and Pakistan Girl Guides Association, lawyers, health care professionals, volunteers and the civil society representatives.